Even though I liked the Coco Beach location very much, I’m never totally happy if I feel I am being coralled. The resort is set apart from the town and has everything you really need to just stay there the whole time, but the instinct to explore is too strong and the family agreed to participate on a canoeing trip on the nearby river. I had already been sea kayaking in Palau earlier in the year, and loved it! 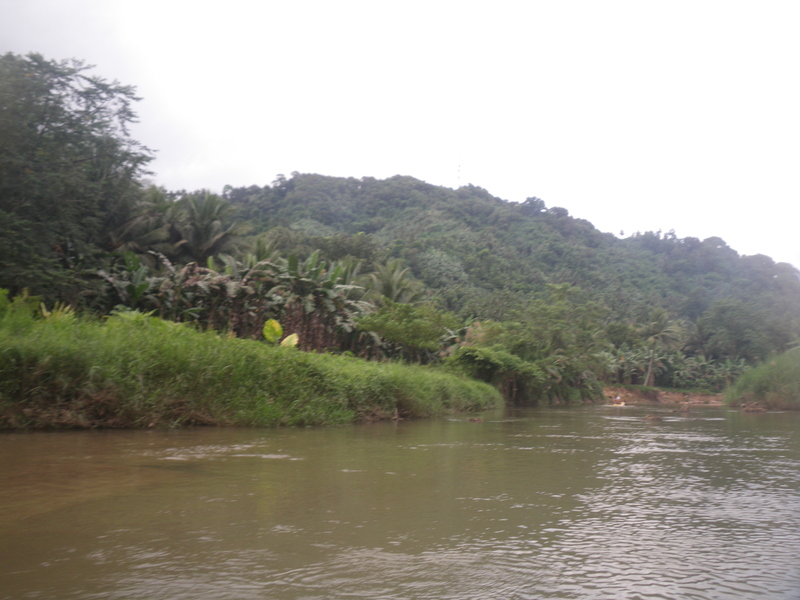 Exploring the scenery at the slow pace of a boat was very inviting, so next morning we headed off on the resort-organized tour with a private jeepney and canoes strapped to the roof… off into the semi-jungle on the still tarmacked road. 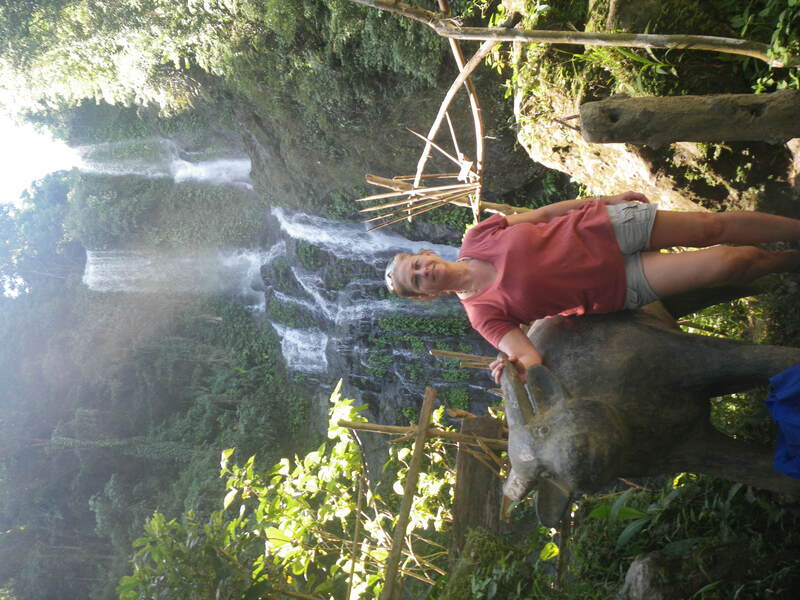 The first stop was to visit the Tamaraw Waterfalls, which is touted as a major attraction near the town. Attractive though they are, I am so glad we didn’t rent a car just to go see them. By ourselves it would probably have pretty much been all we saw, we would have never found the subsequent stops scheduled on the tour, which turned out to be much more interesting. Next up was lunch as at a place they called Hidden Paradise, and hidden it was indeed. 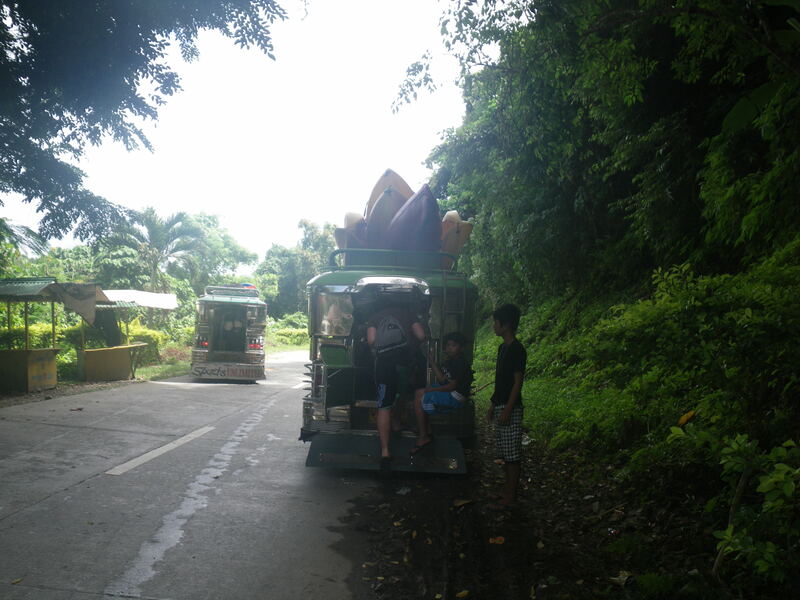 After about twenty minutes of driving on the main island road, the jeepney turned off onto a dirt road and continued for about another 30 minutes past coconut and banana groves, rice paddies, and cocoa trees to what I can only describe as a dead end. Why had we been carried all this way to a field? 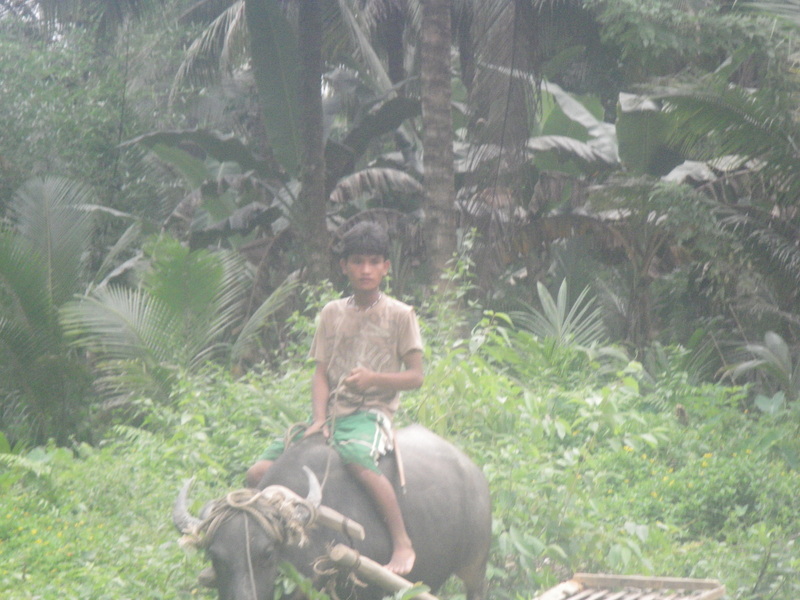 Moments later another jeepney showed, and a few small wooden carts pulled by carabao, the heavy beasts of burden that are so vital to South East Asian agriculture. 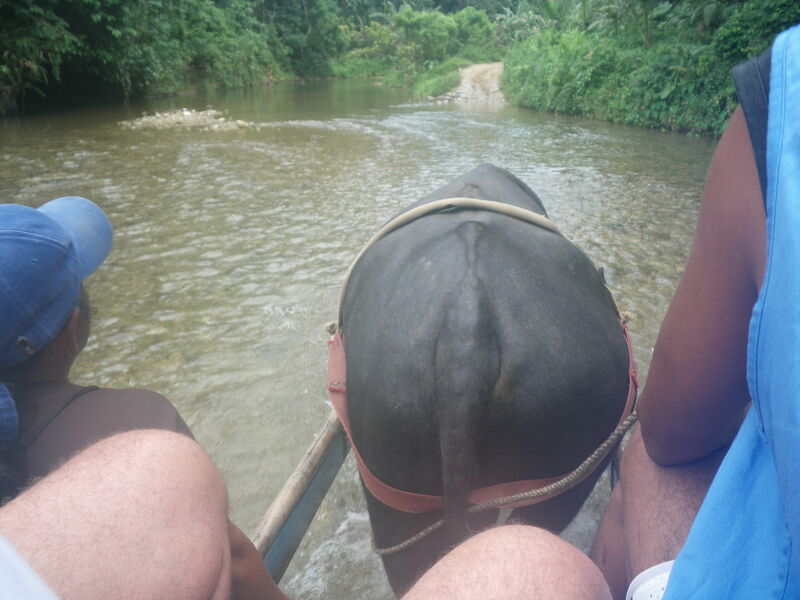 I vaguely remembered something about a carabao ride, and while I was still figuring out what we signed up for, we loaded into the cart. 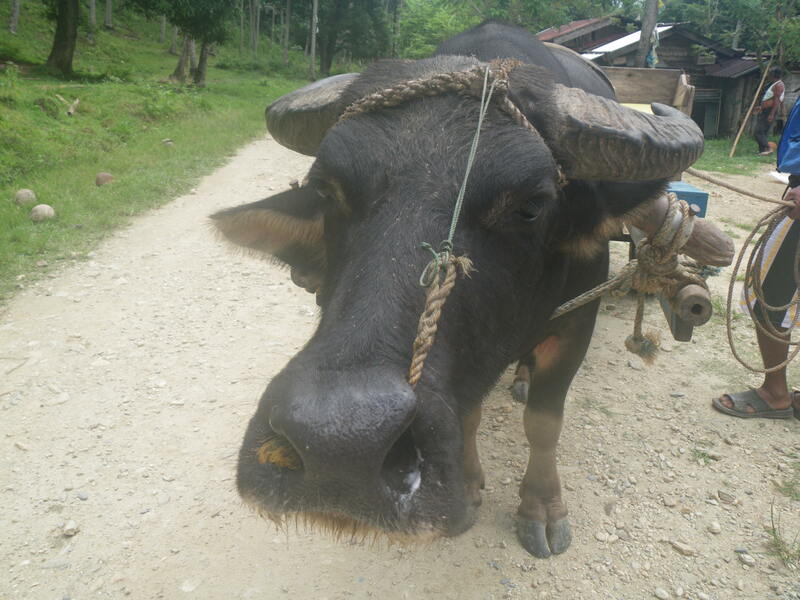 Three adult males, plus me, plus the driver and the cart – we must have been close to half a ton – and the carabao set off. 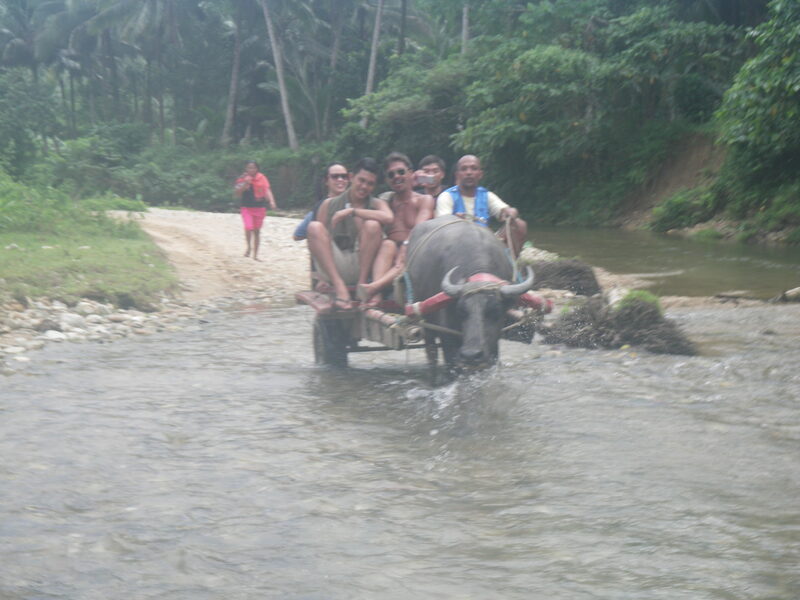 Just as we saw our carabao was starting to flag, our destination came into view. Hidden paradise lived up to its name: a pretty valley complete with waterfall, sculpted water-eroded rock pools, a pretty stream and bamboo shacks on shady banks where they were ready to serve us a barbeque lunch. Our hardworking engine took a well-earned dip in the river, and we dropped off our stuff in the shade and headed over to the rocks. 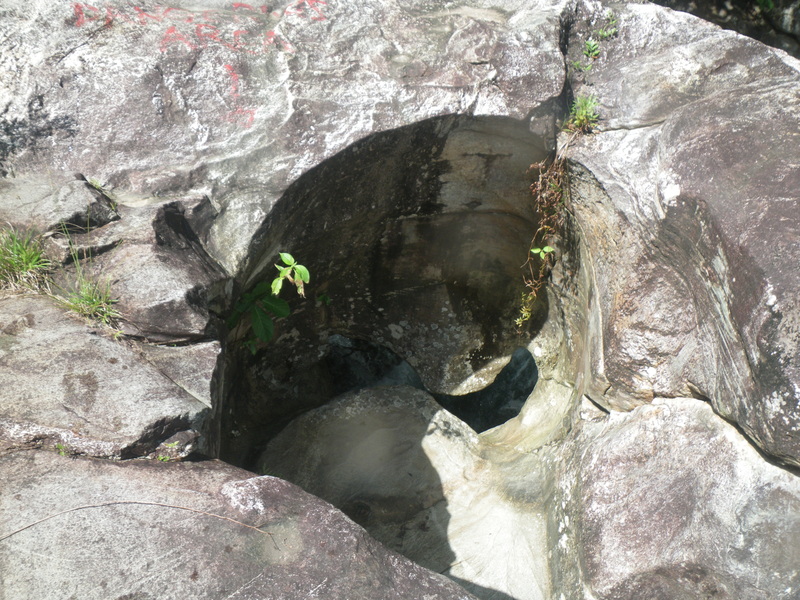 Latham – rock boy – did his favourite thing in the world, climbing up the rocks and planning to jump from a safe spot. Robert and I swam and floated in the surprisingly cold water. It was a beautiful place. Lunch was fantastic too. It was probably the best meal I’ve had in the Philippines yet: BBqed blue marlin, chicken, rice, salad, and excellent fresh fruit. Proof that delicious does not have to be complicated. 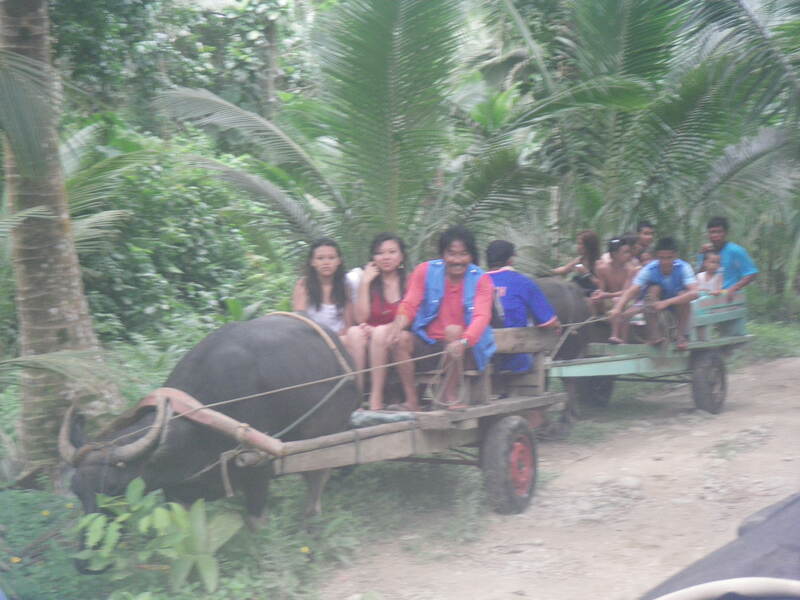 With full bellies we returned back another 30 minutes by carabao to the jeepney. 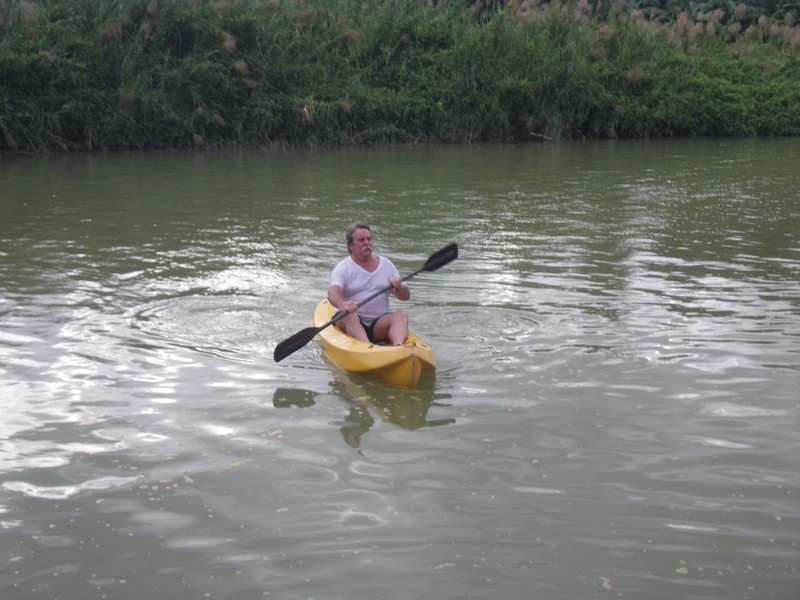 A short ride away was the river for our canoeing trip…1.5 hours downstream in the fast flowing water. 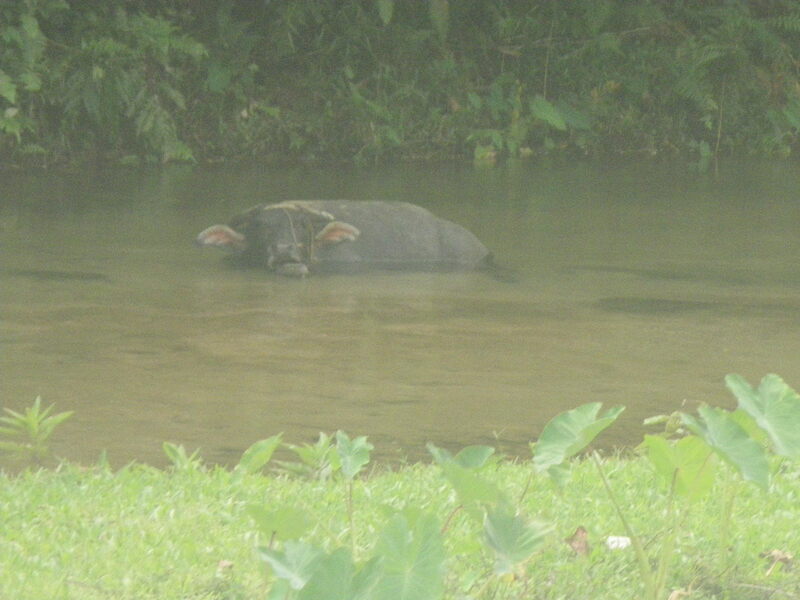 Ankle deep in some spots, neck deep in others, the banks were covered in reeds, silt, and the occasional grazing carabao. The water was so fast and the river terrain so varied that I could not take my hand off the paddle for even a moment to take a sip of water. 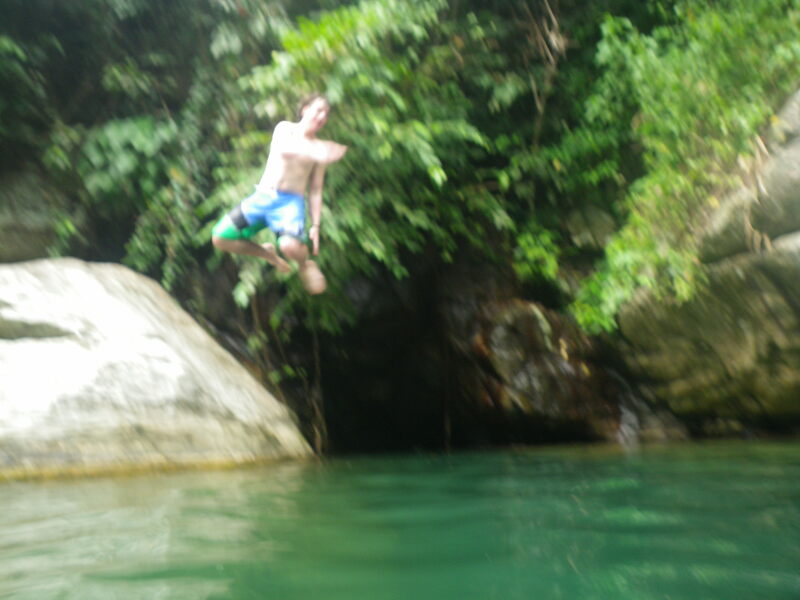 I learnt to watch the river ahead and try and spot obstacles before they were upon me, a skill I learnt the hard way. A fallen tree, half submerged in the river took me out, and I capsized, turning the canoe over completely. The river was just too fast, and I had been too slow to react. But no harm done, and we all managed to arrive safely at the mouth of the river about 1.5hrs later. I loved the river ride, but I wish our guide had been better. He just paddle way out in front, frequently disappearing around a river bend well ahead of us and wasn’t around to help when we needed him. Like the time a bunch of lively local kids decided it would be fun to jump into the river and hang on to the back of my canoe…talk about drag…I almost went backwards… Fortunately, Robert was behind me and shouted them off. The Palau kayak guide had been excellent and stopped frequently for us to regroup, letting the stragglers catch up and shared his knowledge on the flora and fauna. 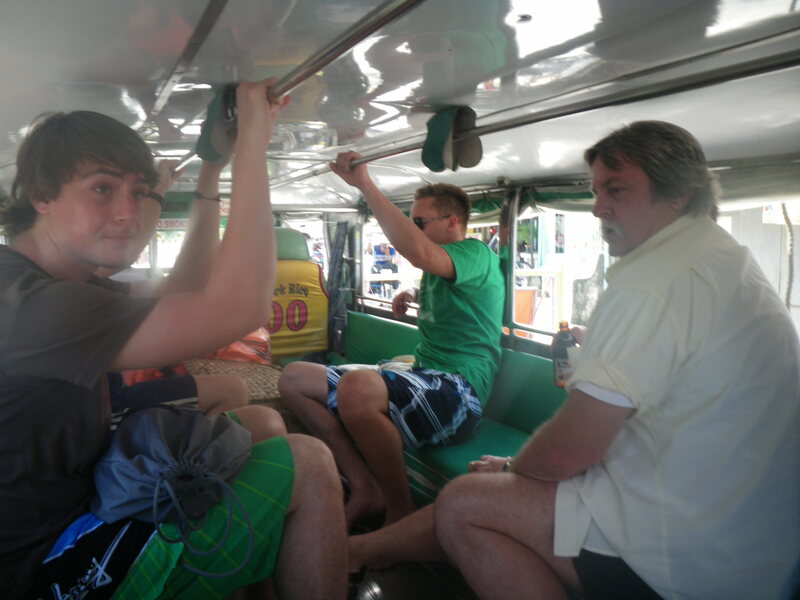 This guy just wanted to get back to the jeepney asap. The canoes were crap too. 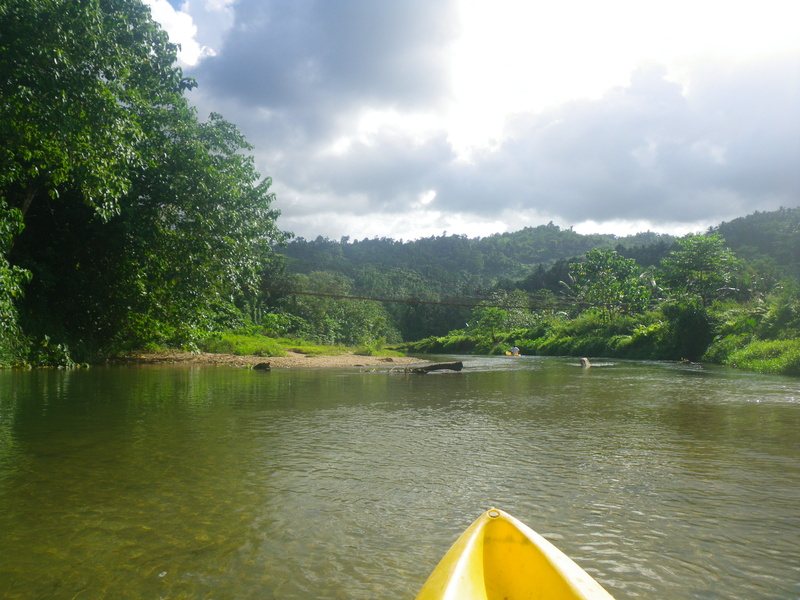 The Palauan tour provided an excellent quality sea kayak, complete with backrest. These were cheap, beaten up tourist canoes for renting by the hour. Our backs hurt badly by the end. The last downer was the water quality as the river broadened and we entered back into town. It had been clean and drinkable upstream. Here I didn’t even want to put my feet in it and would certainly never have entered the river if it had looked like that to start with… Yet, despite these gripes, I really did enjoy the river ride, and the trip as a whole was well worth the investment of our time and money. Anyone fancy another trip?